On the islands of St. John and St. Thomas, residents say they are stranded with scarce food, fuel, and security and are in desperate need of help. 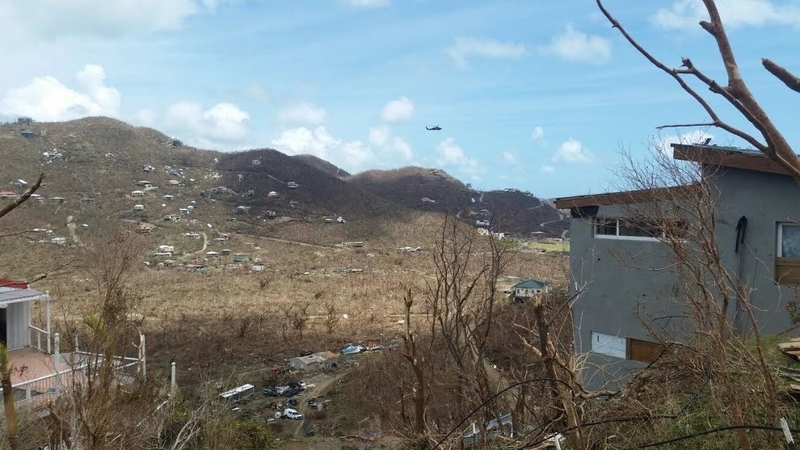 Trekking miles over downed power lines into town to congregate around spotty cell service hot spots like a pizza restaurant and roofless hospital, people in the US Virgin Islands are desperately trying to get calls and texts out to friends and family members with one overwhelming message: "We need help. Things are really bad." “If I had realized how horrific it was going to be, I would have spent all my money to get off this island,” said Scott Borchers, who weathered Hurricane Irma on St. Thomas and secured a seat on a cruise ship evacuating people to Florida Monday night. 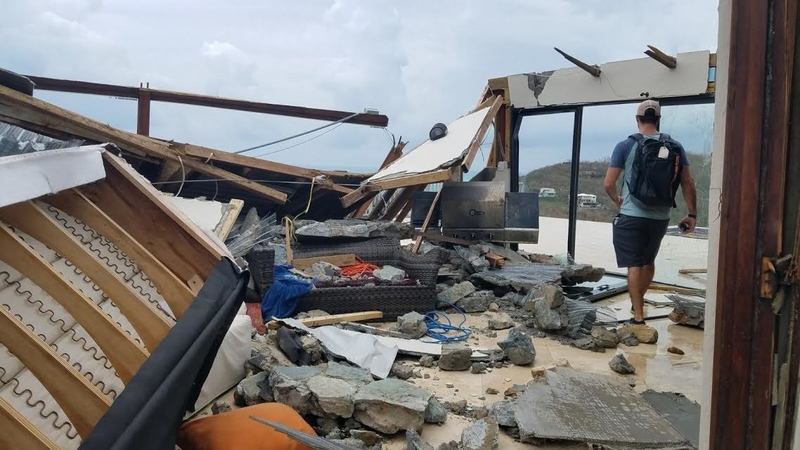 As Hurricane Irma tore through a string of Caribbean islands last week, pummeling the popular tourist spots with up to 185-mile winds, the US Virgin Islands took a severe hit from the storm. Homes, hospitals, and government buildings in the US territory were reduced to rubble. Splintered cell phone towers and trees are still blocking roads, while crushed boats bob broken in harbors, trapping hundreds of residents attempting to relocate. Four people died during the storm, which was responsible for at least 30 other deaths across the region, and the death toll is expected to rise as rescue teams continue to wade through the devastation. Click on the red dots to read Facebook posts from people stranded on the islands. "We are in a very difficult situation here," the territory's congressional representative, Stacey Plaskett, told MSNBC on Monday. "We've lost about 70% of our infrastructure and utility system on St. Thomas and all our utility system on the island of St. John." The small islands have lost their police and fire stations and sustained significant damage to their only airport, Plaskett said, which prompted President Trump to funnel additional disaster assistance to the US territories. The Virgin Islands Port Authority announced Monday it was going to try to reopen Cyril E. King Airport Sept. 16 for commercial flights, but warned that the date is tentative due to the “extensive” damage during the hurricane. Mike Bertolino, a 31-year-old sailor raised on the islands, managed to post live video of Irma raging outside his front door before taking shelter. Whenever they could get phone or internet service, residents posted their pleas, frustrations, and photos to social media groups that have been working to spread awareness about the situation on the US Virgin Islands and attempting to dispatch assistance and supplies to decimated neighborhoods there. After nearly four days without any contact from her sister and brother-in-law, who live in St. Thomas, Christine Christensen, in Southern California, finally received a text message from them on Saturday saying that they had survived the storm. "There's no food, no water, homes are demolished, roads are completely blocked, and there are entire areas where only one or two people have heard from loved ones because there is no electricity and the cell towers were ripped out," Christensen told BuzzFeed News on Monday. She said that her family were able to ride out the storm after they "trekked down the hill into town to try and get gas for their generator." "People are waiting in long lines for food and water and being turned away because they are out," she said. "They really need our help – they can't leave, and we can't go there to help like in Harvey." With the federal government stretched thin as it responds to major hurricanes in both Texas and Florida, residents of the US Virgin Islands — who, though unable to vote in presidential elections, are US citizens — feel like they have been forgotten, left to fend for themselves with minimal resources and aid, according to more than a dozen interviews conducted by BuzzFeed News. People wait in line for gas on St. Thomas. The island has been “like a war zone” over the past several days, Alfred said, with civilians armed with machetes, guns, or tasers more likely to be directing activity than police. She and others interviewed listed a number of unconfirmed break-ins, including reports of stolen ATMs and looting inside partially destroyed homes, stores, and stranded cars. "I heard looting happening in different areas. A friend of mine got her car battery stolen," Emily Minor, a St. Thomas resident who evacuated to Puerto Rico on Monday, told BuzzFeed News. Others, like Erin Kalafski, who lives on St. Thomas, told BuzzFeed News that the reports of widespread looting and violence were overblown. "The government put in a curfew [from 6 p.m. and 12 p.m.] and that's helped," Kalafski said. "There's no time for violence when you must find food, water, and tarps." On Sunday, Alfred told BuzzFeed News that her clinic was running out of food and water but still trying to provide disaster relief with very limited resources. The medical center usually sends patients needing more critical care to a hospital in St. Thomas for more advanced treatment, she said, but it too was leveled in the storm. Nearly every person BuzzFeed News spoke with said a lack of reliable information and internet access had contributed to the confusion and fear. Residents said the government's response has been disjointed, slow, and chaotic. 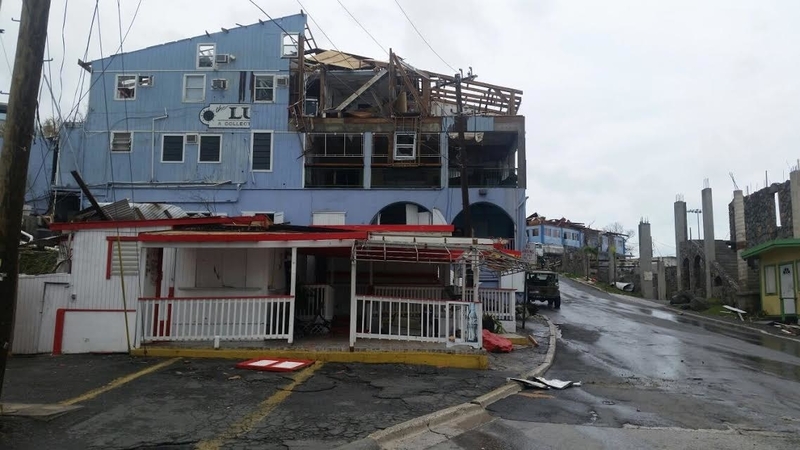 "It took a while for the National Guard to get there but they got things under semi-control," said Cacki Taylor, a 53-year-old crisis counselor who lives in St. Thomas. "We're expecting two more [supply ships] but it's not enough. None of the boats are bringing food stuff. We need more." In response, Trump bolstered additional disaster assistance to the struggling territories. A US military aircraft carrier will be stationed off St. Croix to help funnel aid to the territories and about 5,000 American service members are being sent to the islands, including 600 Marines who arrived on Monday. The Federal Emergency Management Agency said it is working with the governor's office in the US Virgin Islands to "restore basic services and communications capabilities." "As of this afternoon, FEMA has sent nearly 443,000 meals, 146,700 liters of water, 56 rolls of blue tarp and 13 infant/toddler kits to St. Thomas and St. John for the response effort," Lauren Lefebvre, a FEMA spokeswoman, told BuzzFeed News Monday. Other agencies, such as the US Coast Guard and the US Department of Health and Human Services, have deployed hundreds of personnel to conduct search and rescue missions, provide security, and evacuate patients from St. Thomas "due to the extensive damage to the health care infrastructure" there, Lefebvre said. As of Monday afternoon, the US military has evacuated more than 1,900 people from the region, according to a statement from the Pentagon. Cruise ship companies, private ferries, and civilians have also stepped in to help evacuate people. But many residents still on the islands are unable to get to the spots where federal agencies are doling out supplies, and are getting increasingly desperate, said Darryl Smalls, an electrical engineer who currently runs operations for the Roy Lester Schneider Regional Medical Center, the only hospital on St. Thomas. "They don't know when your next meal is coming. There's no roof over their head. No money coming in. People are going to bed with water falling on them from rain," he told BuzzFeed News. "People are trying anywhere they can plug in a cell phone to recharge their batteries." Smalls, who was born and raised on St. Thomas and is a former commissioner of the Virgin Islands Department of Public Works, applauded the government's response but noted wearily that the storm has made it nearly impossible for people to get help. "I've never seen this type of devastation before. It's ruined our entire infrastructure as a whole," he said. "For people living on the outskirts, help might be days or weeks away." Sara Gennusa said the strict regulations imposed on resources "made it feel like a third world country." "Water is being rationed at a premium. Armed guards are at stores and we can only spend up to $100, which doesn't get you very far here," the 34-year-old told BuzzFeed News on Monday. Gennusa, who has lived in St. Thomas for nine years and works at the Havana Blue restaurant on the Marriott resort property, relayed another concern facing many across the Caribbean: how they will recover economically now that Hurricane Irma has ruined the once-picturesque islands usually overrun with tourists. "Most people here work in tourism and that's how we make money," Gennusa said. "That industry is ruined for a long time and now we have to reassess what we are going to do with our lives." When asked why they didn't leave the islands as reports of Hurricane Irma's potentially catastrophic effects overwhelmed news reports and social media, US Virgin Islands residents BuzzFeed News recounted stories of canceled flights and outrageous prices. But some said that they simply did not know the storm would be this devastating. "We didn't have a choice. We had to stay here," Alfred said, noting that she tried to fly out but everything was booked. "There was nowhere for us to go."